Pietersite is a beautiful and unique semi-precious stone, increasingly popular in jewelry designs and beadwork. Learn more about it here. Pietersite is a unique and powerful semiprecious gemstone growing in popularity with lovers of unique jewelry. You can find it used more and more in handcrafted beadwork and sterling silver-set designs, as well as collected and appreciated for its notable metaphysical and healing powers. It may look similar at first to Tiger's Eye, and it does include inclusions of Tiger's Eye within it, but this stone can also take on many different unique and striking appearances - no two pieces of it are ever exactly the same. Some are dark brown, others red and stormy, still others cloudy and almost like a moonstone in appearance. Here you will find a collection of information about Pietersite as well as have the chance to shop for great pieces of jewelry featuring it on eBay and from other sources on-line. Whether you're looking for necklaces, bracelets, rings, earrings or loose stones for beading, you'll find many different selections of beautiful stone jewelry to enjoy. Jewelry and stone photos on this page are by the author, sockii, unless provided by Amazon or eBay. Pietersite is an opaque chalcedony or quartz stone, with a chemical composition of SiO2. 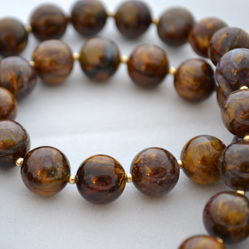 It is a natural combination of tiger eye, jasper and hawk eye, giving it a strikingly unique and variable appearance with characteristic chatoyancy as you will find in pure tiger eye. The stone was first discovered by Sid Pieters in 1962, on farmland in Namibia, Africa. There are currently only 2 known sources for it: Africa and China (and actually the Chinese variety is not officially recognized as true pietersite, because of its different composition. See this article on Pietersite African vs. Chinese for more information.). Its relative rarity can make it a more expensive semiprecious stone, which has only more recently been more widely utilized in jewelry work. Pietersite can exhibit a variety of colors from brown to blue to red to gold, along with of course the tiger eye chatoyant sections. This variety of colors means that it works well in many different jewelry designs and settings. It looks beautiful when combined with onyx and turquoise in beadwork, and can look attractive in both gold and silver settings. Pietersite is known as the "tempest stone" to those who value it for its metaphysical and healing properties. It is believed to stimulate the Pineal gland, thereby improving intuition and insight. Meditating with this stone may lead one into very deep meditative states, possibly even to the point of trances and out of body experiences. It is also believed to help with any breathing problems, relieve exhaustion and confusion, and ease headaches. I've personally been working with pietersite in my jewelry designs for quite a few years now. I've found it gets a lot of attraction from buyers at craft shows, who have never seen this unusual stone before. It works well with any number of different skin tones and hair colors, with its natural variation in color and vibrancy. I love working with it and surprising people with some of the unusual facts about the material. Pietersite is really beautiful in ring settings. Every piece is unique because of the variations in natural stone colors and banding. Its dark and bold enough that it is good for both men and women's rings—and jewelry in general. Check out some of the great pieces currently for sale on eBay, which is one of the best places to look for pietersite jewelry today at great prices. What stones and materials work well with this stone? Ebay is a great place to search for pietersite cabochons and beads for jewelry making, if you can't get to a bead shop or show to buy them in person. Just be sure to examine photos closely to get a sense of the quality of the materials and to make sure it's the real thing, and if possible whether it's the African or Chinese variety (the Chinese tends to be less expensive.) Of course both varieties make for lovely, striking jewelry designs. I can't say I've encountered "fake" pietersite in my experience, because it's hard to mimic that chatoyancy effect. The more reddish-brown varieties can look somewhat similar to poppy jasper at first glance, but the jasper won't have the chatoyancy of pietersite. That's one easy way to tell the difference. As a beader myself, I love working with this stone! The two pieces above showcase some simple yet elegant ways to make jewelry with pietersite. If you have a very stunning pendant piece, don't detract too much from it; one the left I've set it one off with some light citrine oval beads, gold spacers and a few small poppy jasper beads. On the right, I let some lovely large round pietersite beads speak for themselves with just small gold beads between them. It's a classic look that's never out of style in jewelry. Buy cabochons, beads and handcrafted jewelry. Stunning, original pendants and earrings, along with tumbled stones and points. Exceptional quality. Great matched pairs for earrings, pendants, and even fully carved rings. Nice pendants set in sterling silver.